The Magneto Reverse Signal Free indicator is based on the candlestick analysis. It identifies the reversal points. 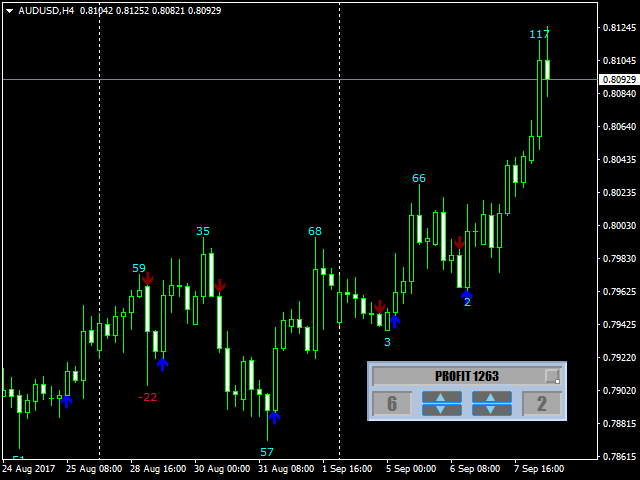 This version of the indicator works only on AUDUSD. To purchase the full-featured version, see Magneto Reverse Signal. Adjustment of the indicator is reduced to selection of parameters Period (left window of the panel) and Gate (right window of the panel). It is more convenient to adjust the settings using the control panel directly on the chart. In this case, you can immediately see which optimal parameters can be used in the current market. This method is shown in the video in the product description. That is, you are required to obtain as few negative entries and as many positive signals with a greater profit as possible (on the chart, loss is indicated by red, profit is indicated by blue, in points). If the "noise" - frequent oscillations in the same range - is present on the market, increase the values of Period and Gate to reduce the unprofitable trades. If there are mainly trend movements, increase the values of these parameters for receive signals earlier and to increase the profit. Select the trading instruments and parameters corresponding to the listed recommendations (the presence of a trend, "small noise") in advance. Note, if you disable the panel, the settings specified in the indicator properties will be activated. Suitable for scalping and medium-term trading. Any timeframe, but H1 and higher are recommended. The number and quality of signals, the potential profit/loss is determined by user and visible right away. Configuration using a movable panel right on the chart. Panel - enable the control panel on the chart. Arrow pointgap - distance from the signal arrow to a candle.